In the world of cinema and filmmaking I like to imagine the UK's Royal College of Art needs no introduction. Weve had some amazing alumni; Director Sir Ridley Scott, novelist Len Deighton, and Sgt Pepper artist Peter Blake have all walked the halls. Vacuum designer James Dyson imagined his revolutionary vacuum here. Our students go on to be among the most gifted and celebrated creators in their field, with filmmakers winning Oscars, BAFTAs, Emmys, and film festival prizes from around the world. Our student projects have garnered awards as well, including the BAFTA Award-winning Eagleman Stag by Michael Please, and of course Susie Templeton's 2008 Academy Award for Peter & The Wolf. 2012 marked the college's 175th anniversary as a centre of the arts in the United Kingdom. That said, the work never stops, and innovation is a daily ritual here, part of the fabric. The Royal College of Art stays at the top of its game technically out of necessity especially as film and television production becomes increasingly digital. More than ever, we have to strike a balance between helping our students create to the best of their abilities, while still delivering finished projects that are in compliance with global regulations that evolve almost on a monthly basis. One such requirement is audio loudness, now governed by a growing collection of international standards including ITU-R BS1770/1, ATSC A/85 and EBU R128, and the CALM Act. Towards achieving that creativity/compliance balance, one of the smartest moves weve ever made was to adopt NUGEN Audio software tools for our audio design curriculum. NUGEN Audios VisLM is a deceptively easy-to-use tool that provides detailed, objective loudness measurement, history, and logging facilities, and LM-Correct is a stand-alone system that provides automatic, faster-than-real-time loudness analysis and correction for our archival material and legacy films. Both tools integrate perfectly into our full-protocol 5.1 audio studio and work with our Avid Pro Tools ICON audio mixing control surface, providing compliance with ITU, ATSC, and EBU loudness standards. Put simply, VisLM provides an easy-to-use method of comparing and contrasting loudness during production, broadcast, and post-production. With true-peak level metering that provides inter-sample accurate level monitoring, VisLM takes the guesswork out of loudness monitoring and compliance so that our students can concentrate on learning to mix audio by ear. The system provides a single, high-contrast, and easy-to-read screen that makes the loudness variables very clear with just a glance. Students are able to concentrate on their mixing and their creative decisions, and simply look up at the VisLM monitor periodically to ensure theyre in compliance. In this manner, VisLM demystifies and simplifies loudness compliance, a topic that is generally perceived to be difficult and complex. In addition to real-time loudness monitoring, VisLM-H provides a history window that enables students to specify a quantity of film that has already had the mixed sound applied, and then review that segment of film to ensure that it is within loudness thresholds. VisLMs extremely simple graphical user interface makes this type of quality assurance fast and easy. With the increase in requests to re-release and re-purpose Royal College of Art archival films, NUGEN Audios LM-Correct is a valued resource. LM-Correct enables students to make rapid, intuitive corrections to loudness and bring it into compliance without altering the directors original creative intent for the sound. With LM-Correct, we can fix audio that was not originally mixed with loudness standards in mind, such as older legacy films or television programs. We can also use the tool in conjunction with VisLM to fine-tune audio mixed to loudness requirements from the outset. LM-Correct includes drop-down menus for selecting the loudness compliance thresholds for the region of the world in which the program will be distributed taking the guesswork out of international compliance. Whether students are mixing sound for a production from Bollywood or Hollywood, they have the assurance theyre operating within the rules for the target geography. Both VisLM and LM-Correct score high with students as interested in their vision as in the technical detail. Many of them come from the industry and are already well-acquainted with the perceived complexities of loudness measurement and compliance. 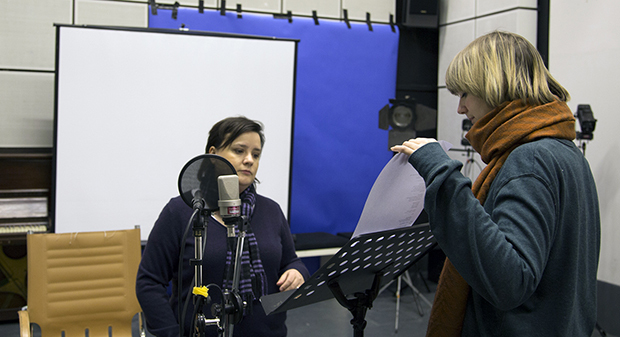 These students are always surprised at the ease in which they can ensure their audio work is within compliant loudness thresholds, while being able to concentrate on the creative aspects of completing the audio for a new film or protecting the creative intent of an archival piece. At the Royal College of Art, advanced technologies play a critical role in helping us provide the finest-possible education for our students by giving them the tools they need to raise the quality of their work and become better filmmakers. With NUGEN Audio VisLM and LM-Correct, they can focus on the creativity that will make some of them world-renowned filmmakers someday but with the assurance that their work will also be compliant.